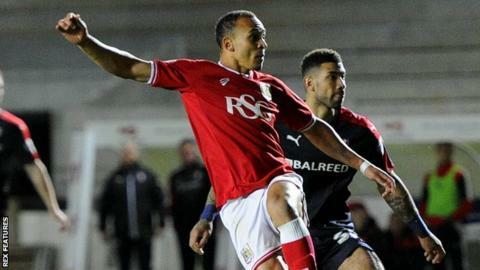 Peter Odemwingie's second-half goal earned Bristol City a draw against fellow strugglers Rotherham. Matt Derbyshire put the Millers ahead when he collected Richard Wood's pass and lobbed keeper Richard O'Donnell. Lee Camp saved brilliantly from Robins defender Aiden Flint's header to keep the scores level before the break. Odemwingie levelled with a powerful left-footed shot, before Camp made another good save from Odemwingie's late header to secure his side a point. The result leaves Bristol City 20th in the table, seven points clear of the relegation zone, with Rotherham one point further back in 21st after extending their unbeaten run to seven games. Lee Johnson's side controlled possession throughout, with Flint unlucky not to equalise before the break on his 100th consecutive league start. But the hosts were rewarded for their pressure when Scott Golbourne's cross fell for Odemwingie to fire in his second goal in four games, having failed to score in the league since May 2014 before moving to Ashton Gate. "It was always going to be difficult, it was a bit edgy, the referee probably didn't help he had a poor 15 minutes. "Our players were getting frustrated, I was getting frustrated and the fans were getting frustrated. "But we kept our composure, kept our structure and we were the side that looked like going on and win it in my opinion." Match ends, Bristol City 1, Rotherham United 1. Second Half ends, Bristol City 1, Rotherham United 1. Jonathan Kodjia (Bristol City) wins a free kick on the right wing. Attempt missed. Jonathan Kodjia (Bristol City) header from the centre of the box misses to the left. Attempt saved. Jonathan Kodjia (Bristol City) right footed shot from the left side of the box is saved in the bottom left corner. Assisted by Marlon Pack. Attempt missed. Richard Wood (Rotherham United) header from the centre of the box is too high. Assisted by Lee Frecklington. Attempt blocked. Luke Freeman (Bristol City) left footed shot from outside the box is blocked. Luke Freeman (Bristol City) wins a free kick on the left wing. Foul by Stephen Kelly (Rotherham United). Attempt missed. Danny Ward (Rotherham United) right footed shot from outside the box misses to the left. Assisted by Lee Frecklington. Offside, Rotherham United. Stephen Kelly tries a through ball, but Danny Ward is caught offside. Attempt saved. Danny Ward (Rotherham United) right footed shot from the centre of the box is saved in the top centre of the goal. Assisted by Grant Ward with a cross. Corner, Bristol City. Conceded by Lee Camp. Substitution, Bristol City. Jonathan Kodjia replaces Peter Odemwingie. Attempt missed. Aden Flint (Bristol City) header from the centre of the box misses to the left. Assisted by Luke Freeman with a cross following a corner. Attempt saved. Peter Odemwingie (Bristol City) header from the centre of the box is saved in the top centre of the goal. Assisted by Adam Matthews with a cross. Nathan Baker (Bristol City) wins a free kick in the defensive half. Substitution, Bristol City. Luke Freeman replaces Scott Golbourne. Offside, Rotherham United. Danny Ward tries a through ball, but Leon Best is caught offside. Attempt saved. Joe Mattock (Rotherham United) left footed shot from outside the box is saved in the bottom left corner. Assisted by Greg Halford. Leon Best (Rotherham United) wins a free kick in the attacking half. Attempt saved. Kirk Broadfoot (Rotherham United) header from the centre of the box is saved in the bottom right corner. Assisted by Greg Halford. Offside, Bristol City. Nathan Baker tries a through ball, but Peter Odemwingie is caught offside. Attempt missed. Richard Smallwood (Rotherham United) right footed shot from outside the box is too high. Attempt blocked. Greg Halford (Rotherham United) right footed shot from outside the box is blocked. Assisted by Leon Best. Substitution, Rotherham United. Danny Ward replaces Matt Derbyshire.